Let's see... I have one tween son, two busy cats and a hundred plus year-old home. Life before we received our surprise package from Fresh Wave was very "flavorful", to say the least. We have those well-loved Converse that are kicked off to the side of our front door, kitty litter that sometimes causes me to reconsider my love for pets, our beloved fireplace, the forever damp basement and mothball-filled attic and everything including the kitchen sink in-between. Thank you to the team from Fresh Wave for an invitation to participate in the Fresh Wave Launch and a promotional item for the purpose of facilitating this advertorial. "We believe in our product’s ability to be tough on odors but gentle on the environment. When you use Fresh Wave, you can rest assured that you are using a product that will remove odors without doing any harm to you or your family. We wouldn’t have it any other way. But if you aren’t happy after using Fresh Wave, let’s chat." I was beyond excited to learn about Fresh Wave, it is a natural odor eliminator that is safe, and effective way to wave away those less than favorable odors we encounter daily. Fresh Wave uses a unique combination of nature and scientific advancements to eliminate odors completely. This crunchy mama supports that the products are all tested to safe for use around children, pets, and the planet while working as a proven effective odor eliminator. 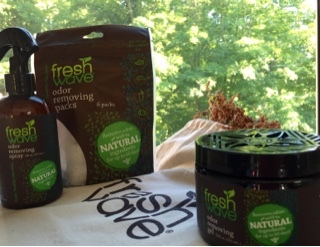 Fresh Wave products work to keep life #HappyHealthyOdorFree without harsh chemicals and artificial scents. Their products are not air fresheners, they are odor eliminators based from plant oils and water. Each and every product in the Fresh Wave family product line is safe, natural, non-toxic, non-hazardous, and effective against any odors. As a person that is highly sensitive to odors and encouraging green living in our lifestyles, I certainly limit adding additional scents and aerosols into our environment. Recently, we discovered the tween's winter snow boots in the attic stored in a plastic bag in the middle of August. No words. I cannot describe my- let's just say surprise at the discovery. That was the day that I put Fresh Wave to the test. Simple to follow Fresh Wave Odor Removing Spray pump directed me to- Shake. Spray. Smile. It took a few sprays and a special moment outside in the fresh air, however I will no longer be embarrassed to claim my son and/or those boots! For more information about #HappyHealthOdorFree Fresh Wave products exclusively available at Target, visit happyhealthyodorfree.com. I have received a promotional item from Fresh Wave for the purpose of facilitating this advertorial. As the owner of this blog, niecyisms and nestlings, I am compensated to provide my opinion on products, services, websites and various other topics. This blog may contain affiliate links. Even though, as the writer/owner of this blog receiving compensation for posts or advertisements, I will always give my honest opinions, findings, beliefs or experiences on those topics or products. This blog abides by word of mouth marketing standards. I believe in the honesty of relationship, opinion and identity. The views and opinions expressed on this blog are purely my own. Any product claim, statistic, quote or other representation about a product or service should be verified with the manufacturer, provider or party in question.